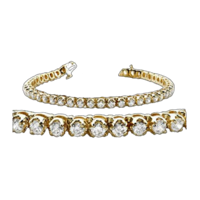 14k Gold Classic Diamond Tennis Bracelet. This diamond bar design tennis bracelet is a very versatile design. Price shown is based on 2 carat 7" length SI2 F/G color stones. Carat weight options include 2ct, 2.6ct, 4.10ct, 5.0ct, 7.90ct, 8.9ct, and an INCREDIBLE 13 carat selection. Email for pricing any length, any carat quality, 14kt, 18kt, and Platinum. 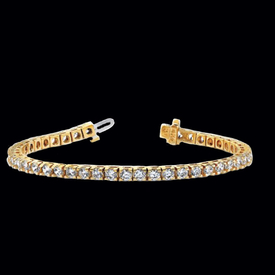 Lovely design 14k Yellow gold diamond tennis bracelet. This delightful style is available in many carat weights and custom made in alternate metals. Price shown is for 1 ctw SI 2 clarity F-G color diamonds. This fabulous design is available in a large variety of carat weights and metals including Platinum, use our special request link or EMAIL for additional pricing. Bracelet is available in lengths from 5 to 9 inches. 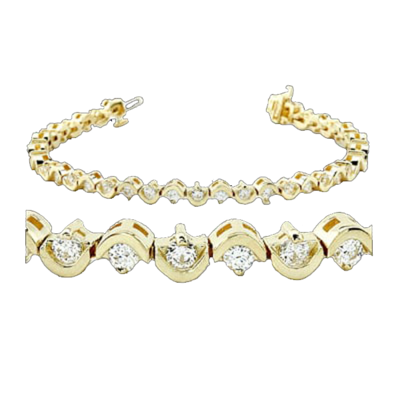 Lovely design 14k Yellow gold diamond tennis bracelet. This delightful style is available in many carat weights and custom made in alternate metals. Price shown is for 3 carat SI 2 clarity F/G color diamonds selection. Alternate diamond qualities listed. Diamonds are prong set, bracelet features a safety clasp. This amazing diamond bracelet style is custom made to order in many lengths from 5 inches to 9 inches. Email for additional pricing. 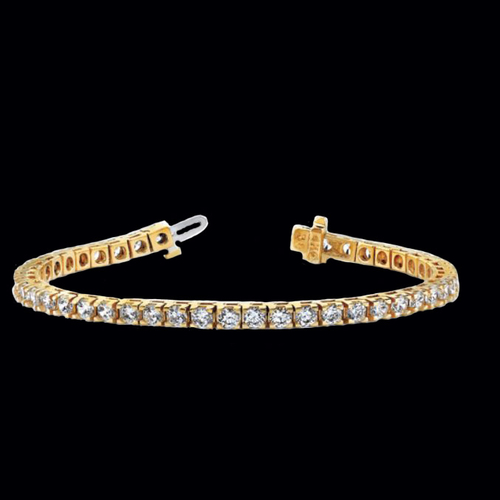 Pretty 14k Yellow gold dainty diamond tennis bracelet. Diamonds total 1 ct tw in this selection, also available in larger carat weight choices. Bracelet weighs 12.1grams. Prong set diamonds each measure .02mm in size. Price based on 7 1/2 inch length. Email for pricing. Available in custom lengths 6-9 inches. 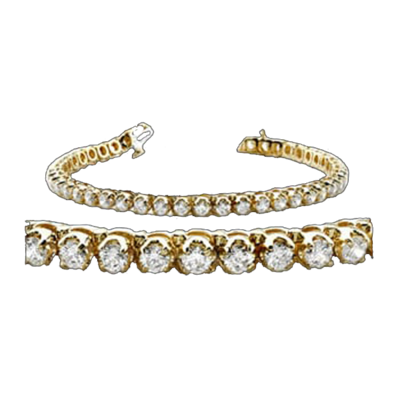 Lovely 14k Yellow gold unique design diamond bracelet. Diamonds total 1.5cttw in this bracelet design. Bracelet measures 7 inches in length. Use our request for custom options. Like this bracelet design? You may customize this with additional carat weights of 2 and 2.5 ctw. Additional diamond qualities and lengths also available. Price shown for the SI2 clarity F-G color stones. Gorgeous 14k Yellow gold diamond three row design bracelet. Diamonds total an incredible 5ctw in this version, also available in a 7, and a 9 carat version. Bracelet measures 7 inches in length, 225 diamond each measure .025mm round. Diamonds in this bracelet are SI 2 clarity F-G color. EMAIL for alternate diamond qualities, lengths, and carat weights. If you like this design make it perfect for you. Order in any metal including Platinum. Beautiful design 14k Yellow gold diamond bracelet is also available in 14k White gold, 18kt metals, or Platinum. Diamonds total 2.54 carats in this great diamond tennis bracelet and alternate carat weights up to 6 carats. Bracelet measures 4.55mm wide by 3.91mm tall. Custom order in ANY length. Price shown for the SI2 quality, F-G color. 14K Gold Hugs and Kisses Diamond Bracelet. This will make an Excellent Gift. Available in 14k Yellow or White Gold and a variety of carat weights. Price shown for the .95ctw bracelet. This Bracelet sparkles without the high power lights. Bracelet weighs 15.93grams. Diamond Tennis Bracelet. This Classic design is available in 14k Yellow, 14k White, and by special request Platinum. Our price shown is for the 6.60 ct tw diamond tennis bracelet. The tennis bracelet is a timeless classic, use our special request link for additional pricing in alternate carat weights. Custom lengths available. Large selection of Carat weights including 1ctw to an incredible 17 carats. Lovely Diamond Swirl Bracelet. 14k Yellow or White Gold and Diamond bracelet available in a large selection of carat weights and diamond qualities. Our price shown is for the 1 carat bracelet. Diamonds are SI 2-3 G-I stones, email for additional diamond qualities from I to VS. Sure to be a Favorite. A gorgeous diamond bracelet. Upgrade or downgrade the diamonds and carat weight for additional pricing. Incredible Diamond Bracelet. Gorgeous 14K White or Yellow Gold Princess Cut invisible set diamonds total 8 1/3ct tw Diamond Bracelet. Bracelet is simply gorgeous. There's almost nothing truer than "Diamonds are forever." Diamonds have always been one of the most intriguing gemstones on earth. Created billions of years ago, even before the dinosaurs walked the earth, diamonds have survived forces of nature and extinction-level events to bring brilliance within our reach. The gem's unbelievable durability and beauty are enough for civilizations to revere it, as has been the case for thousands of years. Diamonds are so rare in their most-sought-after gemstone quality form that reverence to them is almost mythical. Other than being rare in terms of numbers, at one time, only skilled artisans could complement the beauty of diamonds with other precious metals and gems. During ancient times, it was rare to see a jewelry piece that featured diamonds. The gem's resilient beauty has made it highly prized throughout the centuries. Many believe that a diamond is indestructible; however, that is only partially true. A precise strike could damage the gem's surface, but it is closer to unbreakable than anything else on the planet is. The first diamonds appeared 3,000 years ago in India. They were valued because of their ability to refract light, often used as decoration or talismans to ward off or protect against evil. Eventually, diamonds appeared in South Africa as brightly colored stones discovered by a child playing by a river in 1866. Because of the way they were found, the gem cut from these diamonds was aptly named "Eureka." The discovery also led to a huge diamond rush in Africa. Diamonds from South Africa continue to dominate a large percentage of the world's diamonds, although gem quality diamonds appear in countries all over the world each day. What most people do not know is that the majority of diamonds mined around the world are not gem quality stones (only about 20% are). Those not considered such quality see use in drilling and similar applications. Diamond bracelets are an expensive token of love, and not a decision to rush into. Thanks to the growth of online commerce, however, diamond bracelet deals are not hard to come by, assuming you do a bit of homework. As a tip: Make sure your chosen diamonds are conflict-free, meaning they are not from the funding of wars and not mined under poor conditions deemed unethical by the Kimberly Process. Diamond bracelets from Gracious Rose continue to captivate and enchant the hearts of women as symbols of love and expectations for the future. Our handcrafted bracelets feature conflict-free and ethically sourced gems. Get your loved one a diamond bracelet now from Gracious Rose!